If you haven’t already read the health benefits of quitting smoking here are a few you’d like to know. It just might help you kick the habit. As you quit smoking, your body will show remarkable improvements as soon as 20 minutes since your last smoke. Your sense of smell and taste may improve. Your breathing will get easier, and your smoker's cough will begin to reduce. The most rewarding will be being free from the smell, expense, and dependence of cigarette smoking. It is important to understand that the long term effect of smoking is only temporary once you quit, and it signals the beginning of a healthier life. Once you quit smoking you start adding a number of healthy productive days to each year of your life. Most essentially, you greatly improve your chances for a longer life. You significantly reduced your risk of death from several kinds of cancer­, heart disease, stroke, chronic bronchitis and emphysema. 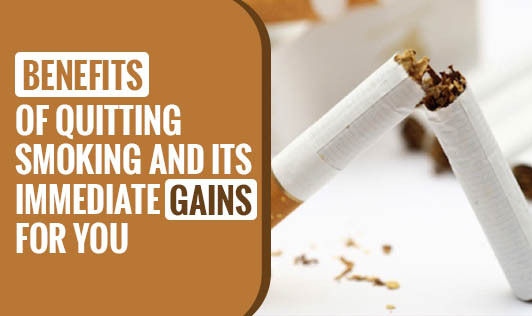 Cigarette smoking is responsible every year for various deaths from cancer, heart disease and lung disease. Cilia regrow in lungs, increasing ability to handle mucus, clean the lungs, and reduce infection.